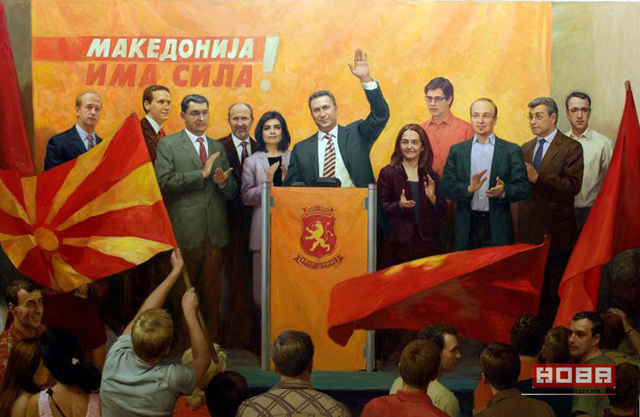 A painting depicting Macedonia ruling party chief Nikola Gruevski, his cousin Sasho Mijalkov, and his associates at a VMRO-DPMNE party rally. Photo by Nova, used with permission. The independent news portal Nova revealed that Macedonia's ruling party placed an order for more than 50 enormous paintings depicting key historical moments that have occurred in the manner of former Communist Party. The order is controversial for several reasons, not least of which is that the paintings were requested in the style of socialist realism, while the party, VMRO-DPMNE, styles itself as anti-communist, and is member of the “center-right” European People's Party. Many of the officials in this party, or their parents, are former members of Macedonia's ruling elite during Communist times. 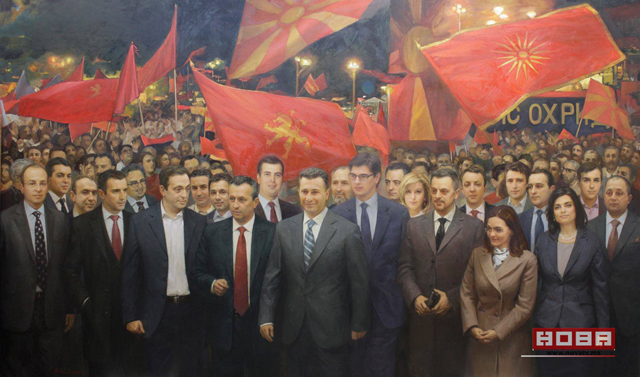 The paintings also depict the current party leader Nikola Gruevski and his close associates in a very favorable light, seemingly adding to his personality cult. In some of the pictures, he's depicted with his wife, and allegedly one of the still undisclosed paintings will depict him with his daughters and mother. The dimensions of that painting are reportedly 4 by 8 meters (13 by 26 feet). 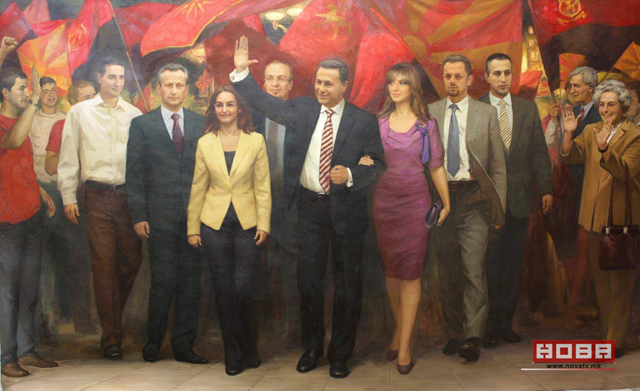 Macedonia ruling party chief Nikola Gruevski, his wife Borkica, and closest associates, including their godfather, Zoran Stavrevski (the minister of finance), on an oil painting. Photo by Nova, used with permission. Even more importantly, the news portal Nova raised the issue of who is paying for the paintings, all of which come in gilded frames. The whole operation is worth several millions of euros. The authors are painters from Ukraine and Bulgaria who had previously received lucrative government contracts to work in the Skopje 2014 project. 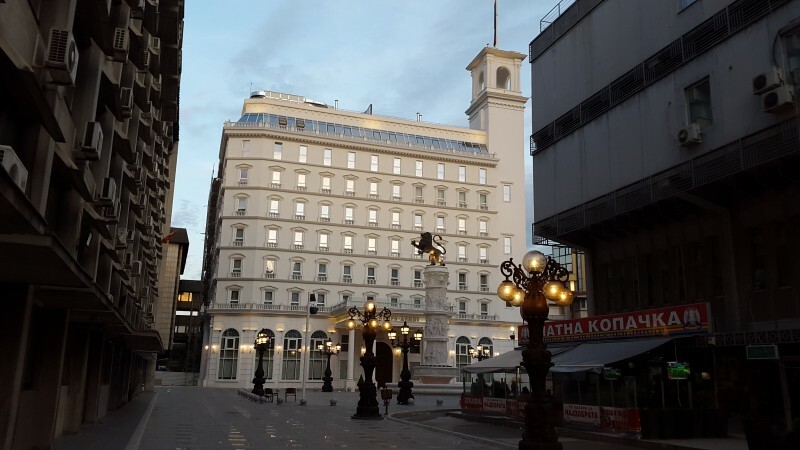 Nova journalist Maja Jovanovska asked representatives of the VMRO-DPMNE if the paintings had been ordered as part of a public procurement contract, but the party's spokesperson, Ivo Kotevski, failed to respond to her calls and messages. The paintings are bound for the seat of the VMRO-DPMNE party building in the center of Skopje, erected in July 2015. The party claims it did not spend a penny on the construction, as it had been built for free by a local contractor who plans to use part of the complex for a hotel. The contractor, Mincho Jordanov, is one of the richest men in the country, and his companies have also been involved in the Skopje 2014 project. 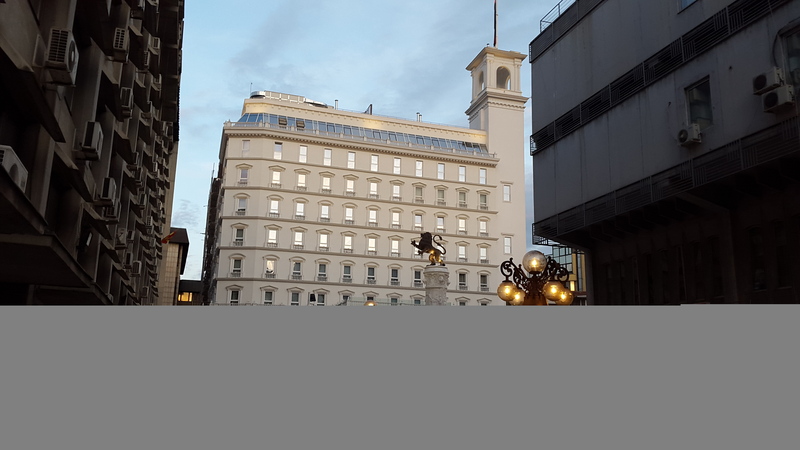 The headquarters of VMRO-DPMNE, Macedonia's ruling right-wing party. Photo by Global Voices, CC BY. 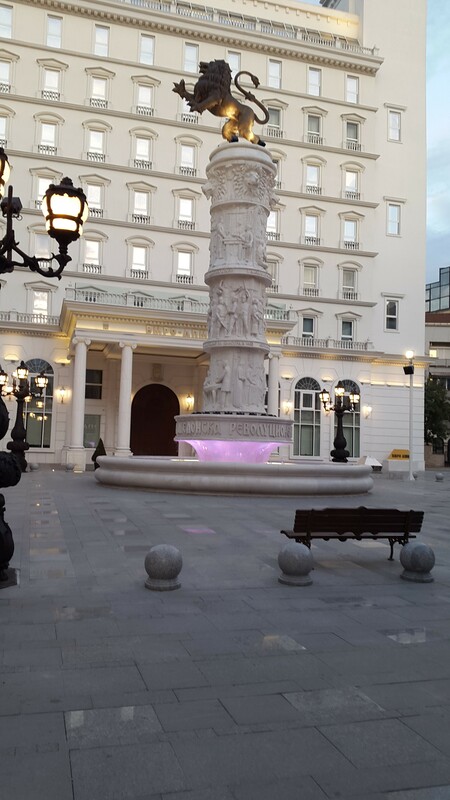 The little square in front of the party headquarters had been financed with public money through the City Government, adorned with symbols associated with the Macedonian Revolutionary Organization, a historic movement to which the party claims “descent.” Macedonian taxpayers also paid for the fountain as part of Skopje 2014 with an imitation of Trajan's Column and atop it the party symbol (the two-tailed lion). With the ongoing “Colorful Revolution” protests, the party headquarters and the square remain the most inaccessible areas in Skopje, under constant guard by heavily armed police forces. A painting depicting a VMRO-DPMNE rally during their “Orange-Revolution” phase in 2006, when they tried to associate themselves with the Ukrainian Color Revolution to show that they are pro-Western. Photo by Nova, used with permission. Social media users quickly draw parallels to other regimes that have used this art style in recent history, both in Europe and around the world. Некој го имал Чаушеску за идол. Погодете кој. Guess who has Ceaușescu for an idol? Hint: Look bellow! Another Twitter user, @parg0, pointed to a painting of China's Mao Zedong. Citizens also noted that current party officials are depicted in a somewhat more appealing manner. For instance, Gruevski is shown a bit taller, in comparison to his very tall henchmen Martin Protuger. Protuger is two heads taller than Gruevski, but in the paintings he's been made shorter. Photos of the paintings have allegedly been leaked by whistle-blowers.